You can’t visit Barcelona, Spain without seeing the work of its foremost architect: the late, great Antoni Gaudí. You might have visited one of his two most iconic masterpieces: the Sagrada Familia and Parque Güell. I’ve been lucky enough to visit these two UNESCO World Heritage Sites, so on a recent trip to Barcelona I decided to visit a third: Casa Batlló. Located in the heart of Barcelona not far from the renowned La Rambla street, Casa Batlló is a beautiful, quirky, anachronistic building. Originally constructed in 1904, its abstract design and brilliant functionality make the house uncharacteristic of when it was built. In fact, it’s said that some of Gaudí’s designs in the building heralded the architectural trends of the late 20th century. Commissioned by the Batlló family, Gaudí was given total autonomy and creative license with his design. He did not even have a blueprint of the building’s construction – just a small, to-scale model he had built and left unfinished so could have total control and supervision of the house’s design. Locally, the house is known as the “House of Bones” because of its visceral, skeletal façade. It looks as if Gaudí intended to avoid using straight lines: oval windows and undulating lines permeate the house. It’s these round lines that look like waves and give the house a maritime motif, like one is underwater. Blue tile runs from the bottom of the house’s interior to the top floor, gradually changing shade from dark to light blue (this also ensures the uniform distribution of light throughout the house). The only exception to this sea-theme is the roof of the house which looks like a dragon’s spine, and the attic which looks like the dragon’s ribcage. Pretty wild imagination he had, right? Despite the surreal aspect of Casa Batlló’s design, the functional aspects of Gaudí’s construction are very real, and made me think how ahead of his time he was with sustainable architecture. First, he controlled temperature and air flow, decades before air conditioning would be used in homes. In several windows and doors, Gaudí designed slits that looked like gills (to go with the sea theme), but were really meant to circulate air. (This is very important considering it was 95 degrees when I was in Barcelona!) Another sustainable design is the mosaic façade of the house. Apparently, Gaudí saved money and resources by repurposing recycled glass and ceramic to create the breathtaking mosaic that covers the entire exterior of the house. Third, the four chimneys on the roof that look like part of the dragon are crooked, polychrome chimney stacks designed to prevent backdraft. Lastly, also on the roof is a large skylight that allows natural light to enter the house. The periphery of this skylight is surrounded by drains that function as a well for drainage from the laundry rooms, located in the attic. Overall, Casa Batlló is a must-see if you’re visiting Barcelona, and an inspiration for architecture everywhere in the world. I loved visiting this house and seeing firsthand how Gaudí brought beauty and functionality together. The audio tour of the house was phenomenal: informative but brief. The living room exemplifies the motif of the strength of the sea. The iconic roof, resembling a dragon’s spine. The various shades of blue tile running through the house. An example of how design functioned to circulate air. The rib-cage design in the attic. Some of the recycled mosaics used for this wall in the house garden. The author on the roof of Casa Batlló. More mosaic and tile in the house garden. Benjamin Franklin once said, “Wine is constant proof that God loves us and loves us to be happy.” Thomas Jefferson was also America’s “first distinguished viticulturalist,” so it’s safe to say the founding fathers probably drank a bottle while founding our country (which would explain a lot). But if wine was consumed during the simpler, more pastoral time of the American colonies, should it still be consumed today in a world battling climate change? Just how environmentally friendly is the wine industry? On a recent trip to Napa Valley in northern California, I got to see firsthand how sustainable the winemaking process is. 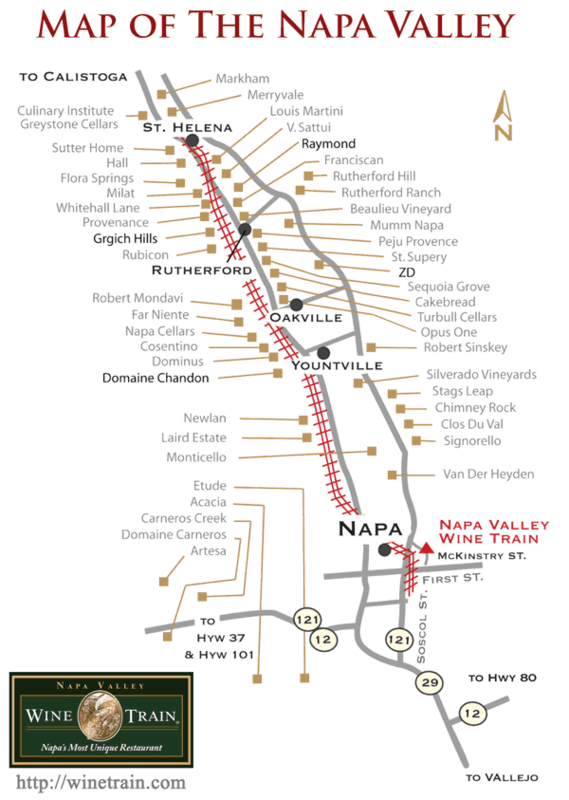 I got to do a number of wine tastings throughout the trip, from “sparkling wine” at Domaine Chandon and Domaine Carneros to flights of red wine at Stags’ Leap and Chimney Rock (you can see a map of Napa vineyards here). Yet one of the most enjoyable tours we took, which was incredibly informative about winemaking and aspects of the process, was at Robert Mondavi Winery. Fifty years since it began, Robert Mondavi Winery does not operate much differently than it did its first year. Although its founder, Mr. Mondavi, has since passed, the vineyard follows its traditional yet sustainable practices it started in the 1960s. For example, the vineyard uses natural pesticides on its grape vines; aphids love roses, so rose bushes and rose trees deter aphids and other pests from eating the grapes. Without the use of chemical pesticides, many vineyards can call themselves organic. The process from the vine to the bottle is also incredibly waste-free. The grape juice or blend is left to ferment in gorgeous wooden barrels, which are large enough to each hold 300 bottles of wine. Robert Mondavi uses 5,000 new barrels each year for their new vintage wines. The barrels are imported from France, which is not so eco-friendly, but after a barrel is used on a wine, they break down the used barrels and give them to Home Depot for planting boxes, or to nearby breweries (which use the fruit flavor of the wine-stained barrels to enhance the taste of the beer). Just as the vineyard does not waste any barrels or wood, not one bit of the grape goes to waste during the process. The Robert Mondavi Winery in Napa Valley. After the grapes are harvested, they are mechanically pressed into “must,” a pulp. About 80 percent of the wine juice comes from this first press, where the grape skins are still on for red wine (which gives it its color, in contrast to white wine). Next, the winery squeezes the grape skins for the next 20 percent of the juice, and this thicker liquid is good to mix to create a red wine “blend.” The final residue of the grape skin is added to a compost, used to fertilize the vineyard. Now that the grapes are de-stemmed, squeezed, and skinned, what about the seeds? Wineries give the seeds to spas because they are very popular for numerous health benefits. Just Google “grape seed oil” or “grape seed extract“- you’ll find about a million combined results. I had no idea that grape seeds were used for skin, and to my surprise, I noticed that the lotions, shampoos, and conditioners at our hotel in Napa were “Grape Seed Age-Protecting.” The manufacturer of these bathroom products was “29 by Lydia Mondavi,” the daughter-in law of Michael Mondavi, the son and co-founder of the winery of Robert Mondavi. Not only is it a small world, it’s a sustainable one. Throughout my trip, I was very surprised that Napa Valley was so eco-friendly. Every minute driving through Napa, you pass a world-class winery with quality only found outside of France. I presumed that beautiful chateau-style vineyards and elegant tourists would mean Napa was not that environmentally conscious. To my surprise, most vineyards had signs or plaques indicating they were organic, advising water conservation to visitors and guests, and providing information on the local landscape and horticulture. Almost every wine tour spoke of the effects of California’s historic drought; Chimney Rock said the drought resulted in about 25 to 30 percent less yield in 2015, and Domaine Carneros said they lost about 15 to 20 percent. Wine seems very elegant, urban, and detached from nature, but it is a very underrated, organic beverage made with lots of careful environmental consideration. Most vineyards had 500 acres, and every few acres produces a different tasting wine. The varying temperatures, vine directions, wind patterns, and features of the valley are what create unique wines. “The unknown quantity is mother nature,” as one winemaker said. Domaine Carneros has 50 blocks of wine, and each is farmed differently. Not only does that take a lot of careful work with the land, but the workers are cared for as well. Most vineyards do all-night harvesting, with workers wearing headlamps while they pick the grapes in the darkest hours of the night. Not only is nighttime the best time to get grapes, but workers also like the cooler conditions. Last but not least, I learned one pretty surprising thing about wine and its relationship with the environment. Walking into one of the cellars at Robert Mondavi, I saw a religious stone statue in the middle of the room surrounded by barrels and barrels of wine. It looked like St. Francis of Assisi, the patron saint of ecology (and who Pope Francis is named for). Because St. Francis was protector of nature and the natural world, wineries have adopted him as their own. From St. Francis Winery to Franciscan Estate Winery, to the bottle labels of Robert Mondavi reserve wine, you see St. Francis everywhere. Who would have thought that I could have one patron saint for two of my favorite things: the environment and wine. The Robert Mondavi winemaking room, with a statue of St. Francis of Assisi in the middle. I personally don’t enjoy talking to people seated next to me on airplanes. I’m the person who brings four magazines and a novel to read during the flight, and I always end up next to someone who brings nothing on the flight — they just read the safety instructions, peruse through SkyMall, and then rely on talking to me. On my flight from Minneapolis to Los Angeles in early October, this was the case. But fortunately, the woman sitting next to me was not your usual air traveler — she is a truly extraordinary person. Michelle has not been on a flight in eight years. Sitting next to her, I could feel her anxiety and how foreign air travel was for her — she struggled with checking in for her flight and printing her boarding pass electronically, and she was nervous about finding her connecting flight at LAX once we arrived. She also does not own a smart phone, and was borrowing her friend’s Samsung tablet for her trip, which I had to show her how to use. I was puzzled by how anachronistic her life was; can you imagine not having boarded a plane since the year 2007? Or not owning any wireless technology besides a flip phone? But when I learned her story, my confusion turned into awe. Meeting Michelle was eye-opening for me because I viewed a glimpse of her unusually sustainable lifestyle, and even though she already has a low carbon footprint (she doesn’t air travel, she grows her own food, and raises her own animals), she still is taking far more efforts than the average person to continue improving the environment. In addition to caring for her farm, Michelle’s day job is supervising a recycling center at the River Falls township. In her nine years of work there, she has helped reduce the town’s waste from 450 tons to 300 tons — a 33 percent decrease for a town of only 15,000. Although Michelle is an exemplary steward of the environment, she is still not immune to the influence of climate change. She told me how in her 30 years in the United States (since she moved from her homeland, New Zealand) she has seen climate change take its toll. On her farm in rural Wisconsin, the climate has altered what she and her husband can now grow. They are thinking of building a greenhouse — an expensive and time-consuming project — just so they can continue to grow their tomatoes because the increasingly cold winters have curtailed the growing season for tomatoes. I thank God for my conversation with Michelle, because I learned a lot from her description of her daily life, and unfortunately I was not very warm towards in the beginning of the flight (I was trying to work on a homework assignment due the following day). But after getting to know her and consoling her (she was flying home to New Zealand because her mother passed away), I left that plane with some deep questions I still cannot answer. Initially I was so shocked by Michelle’s lifestyle — her infrequent travel and lack of wireless technology make her a walking time capsule. Yet on the other hand, this anachronistic way of life is admirably simple and results in a very low carbon footprint. Thus, is it worth being eco-friendly but unexposed to the world and its developing technology? Should I live on a farm and get rid of my iPad and iPhone? Should I stop traveling so frequently by plane? I definitely fly over a dozen flights a year; I’ve boarded about 100 flights in the eight years Michelle has not traveled by plane. That’s a huge difference in our carbon footprints, and frankly I feel very guilty about it; often people argue that it’s impossible to fly less in this day of age, but Michelle is a testament that it can be done. I was also struck by Michelle’s determination to continue reducing waste and improving recycling in her community. If a 54-year-old farmer who lives in rural Wisconsin can have a passion for protecting the environment, then anyone can make the effort to live more eco-friendly. The green movement is not just for millennials or hipsters or people who live in tents in national parks. Michelle is one of the most sustainable people I have ever met, and it’s because she leads a beautifully classic and pastoral life, that subsequently a low carbon footprint coincides with this lifestyle. I hope I can one day have the chance to own a farm and preserve the lifestyle that Michelle demonstrates. Until then, I’ll aim to fly less frequently. It’s known as “The Happiest Place on Earth,” but is it the greenest? Over 650 million people have visited Disneyland since it opened, making it the most visited theme park in the world. In celebration of Disneyland’s 60th birthday earlier this month, it seemed appropriate to also celebrate the California resort’s environmental efforts. Earlier this year, the Disneyland Resort received a Governor’s Environmental and Economic Leadership Award, California’s highest environmental honor, for its waste-reduction efforts. 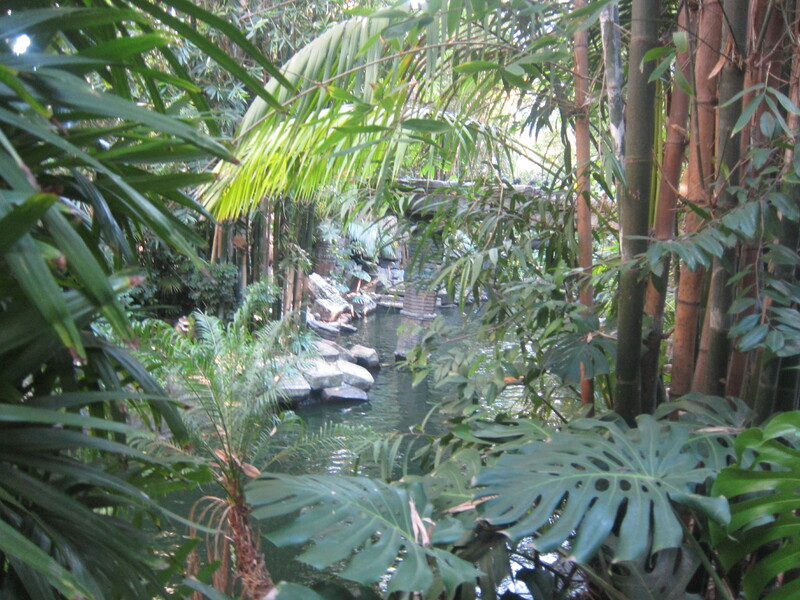 An overlook of the Jungle Cruise in Disneyland Adventureland. Sixty years later, the Jungle Cruise ride has evolved immensely: “Now it has a large tree canopy made up of coral trees, ficus trees, some of the large palm trees and bamboo overhead,” Karen Hedges, director of the Disneyland Resort’s Horticulture and Landscaping, told the Orange County Register. The canopy is as high as 100 feet in some areas of the ride, and the plants have grown as if in a real jungle, retaining heat during the day time so that the tropical foliage stays warm through the night as well. When Anaheim reaches chilly temperatures at night, it will be several degrees warmer under the canopy of the Jungle Cruise. The jungle is so self-sufficient, it doesn’t require much maintenance; landscaping crews occasionally prune the high trees and even let the fallen leaves stay on the ground so the nutrients can naturally return to the soil. The infamously creative — and always conveniently-located — trash cans at Disneyland California. As mentioned earlier, Disneyland is also exceptional at reducing waste. The trash cans at Disneyland are renowned for their individual designs and colorful displays. A bit of “old Disney lore” tells that trash cans are placed every 30 feet throughout the theme park; rumor has it that Walt Disney himself used to watch guests throw away their trash, and each guest would walk about 30 feet until they dropped the trash they were holding onto. 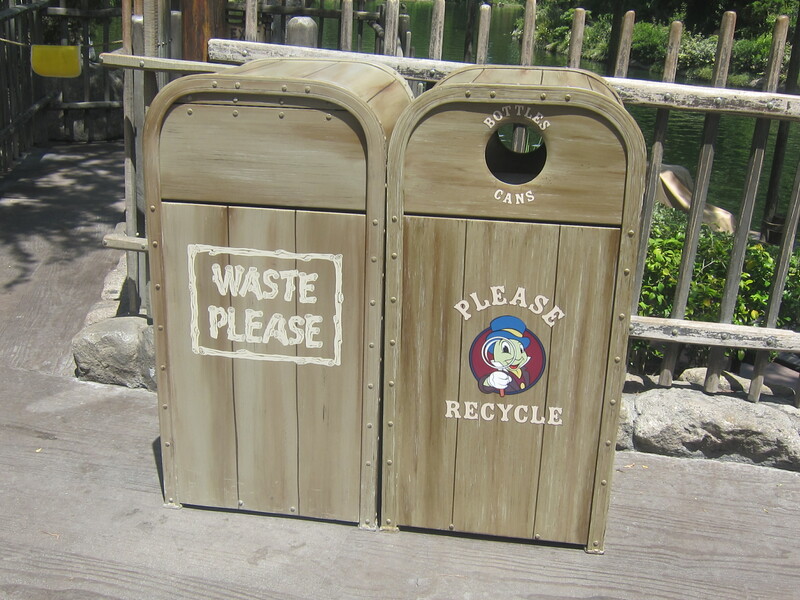 While trash cans may seem mundane, their strategic placement represents Disneyland’s ability to truly know their guests, and how the theme park tries to compensate for their size in environmental-friendly ways. In addition, Circle D Corral (the horse ranch at Disneyland California) has achieved Disney’s overall goal of Zero Waste. The Corral recycles paper, cardboard, plastics and metal, and composts all animal waste, hand towels, laundry lint and coffee grounds from the Disneyland Resort restaurants. The Disneyland Resorts worldwide are introducing exciting environmental initiatives, from electric vehicles in the theme parks to LED lights in workshops and low-wattage lasers for light shows. From Paris to Hong Kong, Disneyland is using its inventive and ingenious spirit to practice environmental stewardship. In Nickelodeon’s SpongeBob Squarepants, the Krusty Krab restaurant is always overflowing with customers who all dine to drool over the famous Krabby Patty burgers. Despite their name, Krabby Patties are not actually made with crab; but if the television show’s restaurant did use real crab, and Bikini Bottom was a town on Maryland’s Eastern Shore, they probably wouldn’t be getting a lot of business this summer. A week ago in Cambridge, Maryland, my family and I were disappointed to find less crabs than we anticipated. There were no all-you-can-eat crab feasts like there used to be a decade ago, and no hard shell crabs on the menu at the local restaurant like there were last summer. At a salon in town, a local woman from Cambridge told me she wanted to buy a bushel of crabs for her family for dinner, but the market price was over $150. (One can imagine what that price would be in a restaurant — astronomical). So why the exorbitant price of crabs? Because crabs are still few and far between in the state of Maryland, and most of the Eastern seaboard for that matter. 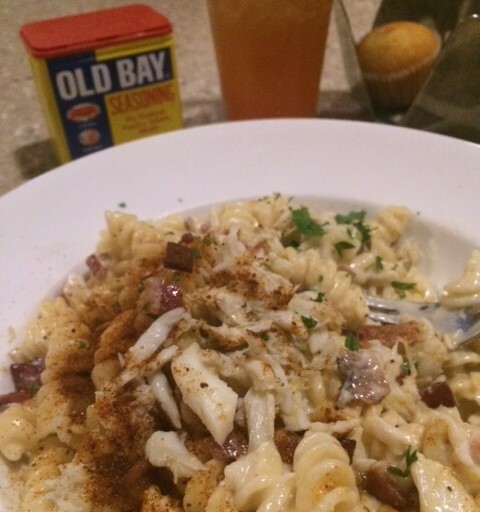 Crab mac-n-cheese at a restaurant in Cambridge, Maryland. Even though they were on the menu, no crab bushels were available. The total number of crabs — including juveniles, and adult males and females — has increased from 297 million in 2014 to 411 million in 2015, the Dredge Survey found. 101 million of these crabs are spawning-age females, which is “a substantial rise from 2014 when adult females were considered depleted,” the Maryland DNR reports. Despite this improvement, the adult female crab population is still well below the numbers observed in 2010 and 2011, and far away from the target level of 215 million female crabs. For those of you who like to enjoy a good crab cake or grew up spending your summer evenings pounding out white crab meat with your wooden mallet, there is no telling when your next crab boil will be. While Maryland and other states have worked hard at boosting their crab populations, there are some factors that no department of natural resources can control. For example, inclement weather can increase crab mortality; about 19 percent of adult crabs in the Chesapeake Bay did not survive the past winter. A greater predator than the historically frigid winters is a neighbor of the Chesapeake crab – the Maryland Rockfish. Over the past few years, many watermen and researchers have frequently found dozens of small crabs inside the belly of a Rockfish. Even though the Rockfish, a striped bass, is the Maryland state fish, it is being given “the blame for low crab numbers.” Although there is little scientific evidence that Rockfish are causing a significant depletion of the crab population, Marylanders say there is no harm in allowing fishermen to harvest more Rockfish from the Chesapeake Bay. Organizations like the Chesapeake Bay Foundation have worked endlessly to boost the blue crab population and provide very useful infographics and fun facts about this scarce shellfish. While crabs are an important crustacean in their ecosystem, they are also important to the many fisheries, watermen, and restaurants that rely on selling them for consumption. Hopefully we will all get to don crab bibs soon. 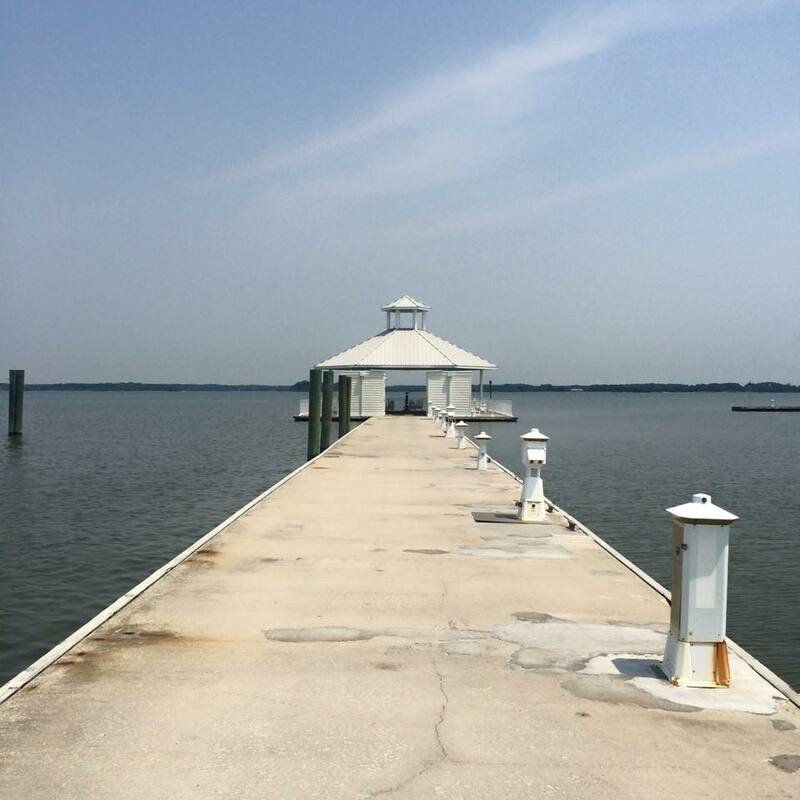 A dock along the Choptank River in Cambridge, Maryland, which feeds into the Chesapeake Bay. Usually children catch crabs here, but there are none to catch. In the year 1971, the Beatles were still recording hit songs, UCLA men’s basketball began its 88 consecutive-game winning streak, Apollo 14 landed on the moon, and the Vietnam War was still going on. Yet 1971 was also the year when the United Arab Emirates was born. 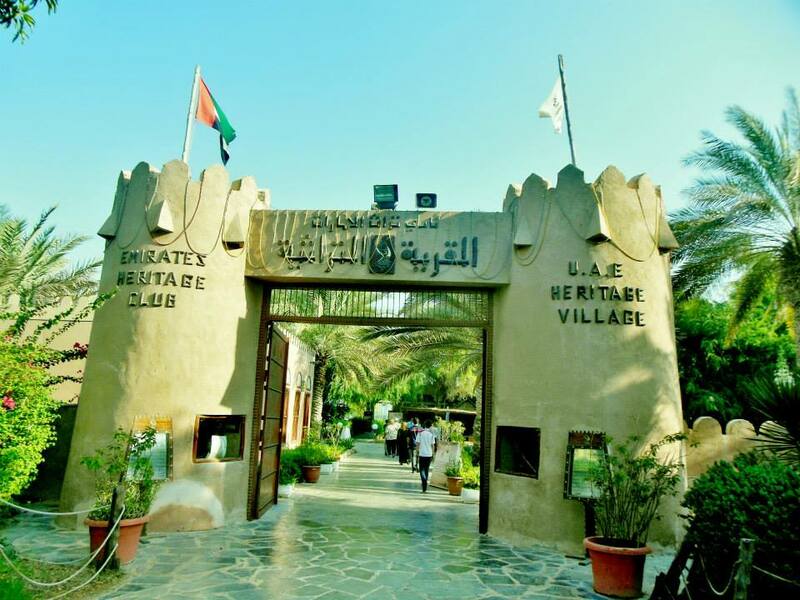 This federation of the six Emirates is only 43 years young, and yet it has established itself as one of the most influential and well-known countries in the world. Your parents have probably been alive longer than the UAE has been established, and yet think of how much this country has accomplished in those few decades. Originally deserts that housed nomadic Bedouin tribes and served as trading centers for the Middle East, Abu Dhabi and Dubai were towns prominent in the pearling industry. Over time, these Emirates along the Arabian Gulf transformed into gold mines for oil and business, respectively; now, Abu Dhabi and Dubai are the capital and most populous city of one of the world’s wealthiest nations. In 2015, the United Arab Emirates is the 6th richest country in the world, according to Forbes. With a GDP per capita of $47,439, the UAE has an exorbitant amount of wealth for its 9.34 million citizens. Yet this wealth comes at a price — despite its youth as a country, the UAE has already made its mark with an exponentially growing carbon footprint. When looking at graphs and scatter plots of countries’ CO2 emissions, the UAE is often noticeably high or off the charts. The World Bank reports that the U.S. is 10th in the world for its CO2 emissions (metric tons) per capita, but the UAE is ranked 8th in the world. The U.S. is 10th in the world for its CO2 emissions per capita, but the UAE — 195 years younger than America — is ranked 8th. The large number of emissions the UAE faces with reducing today began almost a century ago, when oil company teams first conducted geological surveys in the region in the 1930s. In 1962, the first cargo of crude oil was exported in Abu Dhabi. With oil revenues exponentially increasing annually, Sheikh Zayed became Ruler of Abu Dhabi in 1966, and implemented the infrastructure to form the country that now Emiratis (only 16.6 percent of the UAE population) call their homeland. 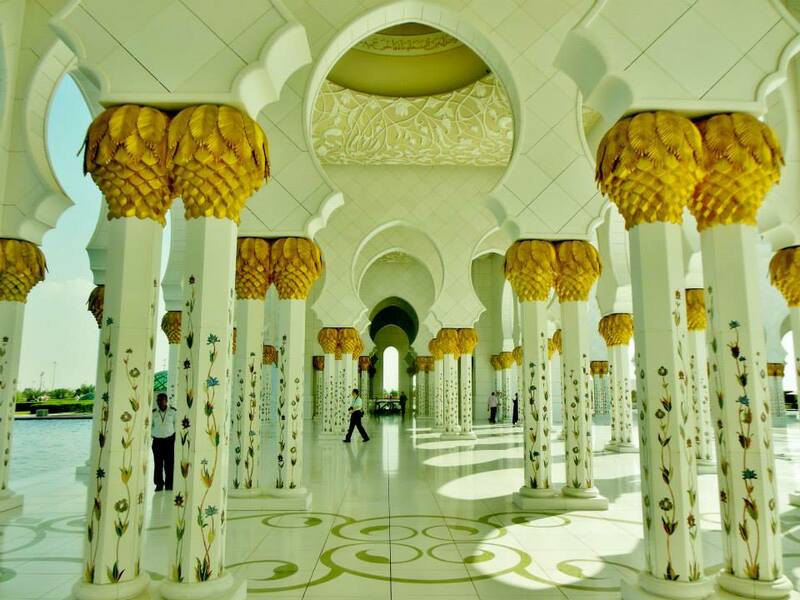 During my visit to Abu Dhabi and Dubai in fall of 2013, I was stunned by the contradiction that is the UAE. Many Emiratis and expats spend their Saturdays shopping at the Mall of the Emirates or strolling along the beach, but the mall food court seemed to sell more falafel than McDonald’s. Anyone in the UAE can import chocolate from Switzerland, but local dates are the preferred sweet. One can hear the muezzin call from the mosque by the 7-star Burj Al Arab hotel, and women in full burkas walk by a sky-high billboard of Beyoncé drinking Coca-Cola ©. 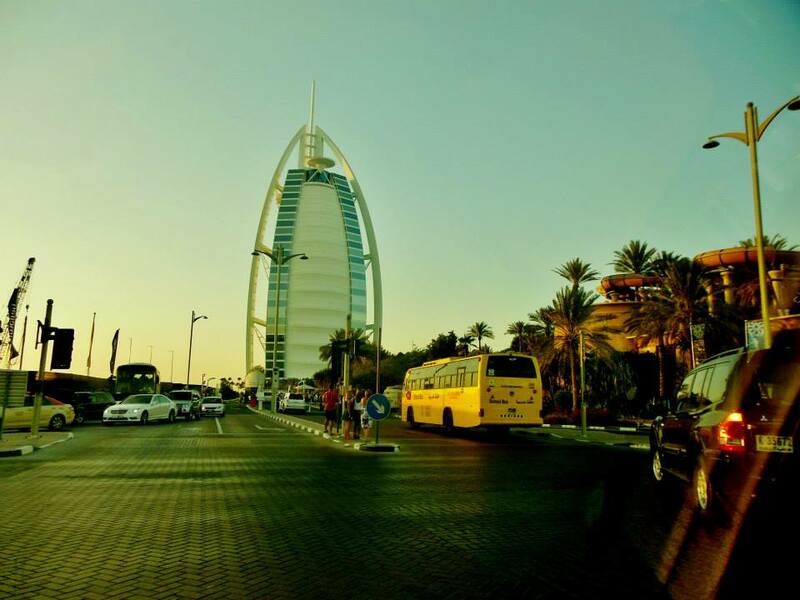 The Burj Al Arab, located on Jumeirah Beach in Dubai, is the world’s only 7-star hotel. The country seems like a paradox, and its conflict with climate change is no exception. The Mercedes G-Class SUV is one of the more ubiquitous cars on the roadways of Dubai; with 12 miles per gallon in the city, the Mercedes “G wagon” sure puts a lot of “g’s” in “mpg”. Requiring a lot more resources than just oil, the Palm Islands in Dubai are artificial islands, shaped like a palm tree, that add 520 kilometers of private beaches to the city of Dubai. The construction of the Palm Islands immediately generated environmental concerns: disrupting wildlife, exacerbating coastal erosion, and depleting aquatic vegetation are just a few of the effects the Palm Islands have incurred on the surrounding Arabian Gulf. From potted orchids in underground mall garages, to gold leaves accenting the street lamps of Sharjah, to the Palm’s underwater Atlantis Hotel and Abu Dhabi’s Ferrari World, the UAE is superfluous. It is paradoxical and almost anachronistic because it is a very technologically advanced and modern country observing a very traditional religion and customs. If Emiratis can live in one of the richest and most advancing countries in the world, while still observing timeless values like family, food, and faith, can the UAE be a rapidly developing country while also being eco-friendly? 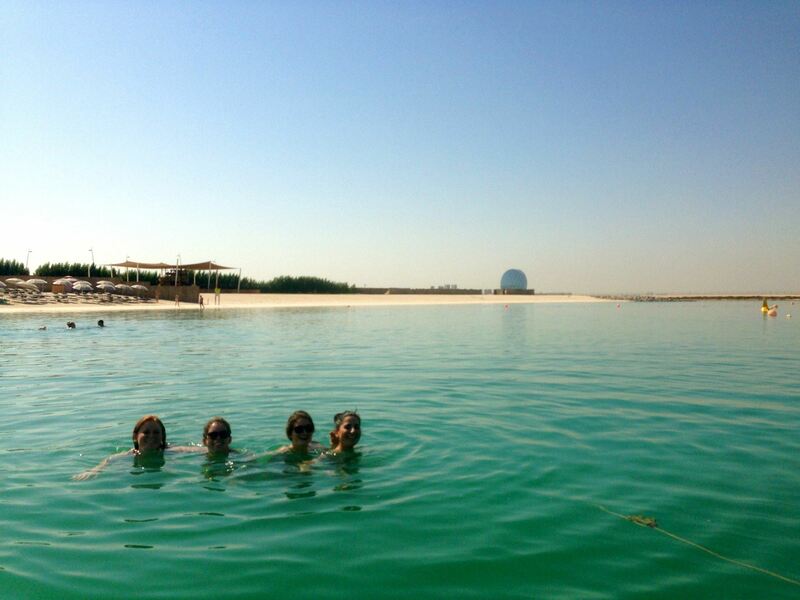 The author and classmates swimming in a man-made gulf along Yas Island in Abu Dhabi. The World Wildlife Fund in 2007 said, “the UAE’s human pressure on global ecosystems (its ecological footprint) [is] the highest in the world. The country is supposedly at present five times more unsustainable than any other country.” If the UAE was on this dismal trajectory in 2007 (three years before the Burj Khalifa tower opened and seven years before the Palm Jumeirah island was finished), then what does the future have in store for this country’s emissions? Earlier this year, the Dubai International Airport overtook London’s Heathrow to become the world’s busiest airport. Dubai, and the greater UAE, are always looking forward to the next big step. But how many steps will they take before their environmental damage is irreparable? This past weekend, I had the privilege of attending my friend’s graduation at Elon University in North Carolina. Founded in 1889, the college is 620 acres large in the town of Elon, North Carolina. A walk on the university’s grounds is far more relaxing than one would anticipate for a center of academia: Elon’s iconic brick buildings, botanical gardens, and gorgeous fountains are why the university has been named the #1 most beautiful campus in the country by Princeton Review, New York Times, and others. The name “Elon” comes from the Hebrew word for “oak,” because of the large number of oak trees on the land where the university was originally settled. Although a majority of the trees had to be cleared to construct campus, “Under the Oaks” is one of the main quads on campus where a multitude of trees still stand. Each year it is the site that welcomes students to campus at the fall New Student Convocation, and it appropriately hosts the conclusion of their college journey at Commencement in the spring. 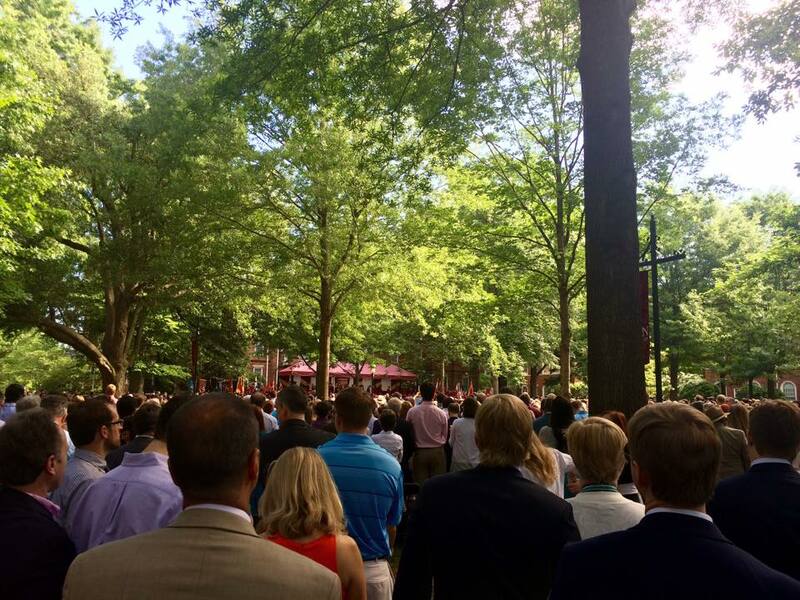 Elon University’s 2015 commencement at its annual location, Under the Oaks. “The history of Elon University is uniquely tied to trees. The school was built in a grove of trees, and took its name from the oaks that remained,” according to the university website. To celebrate its 125 years as an institution, Elon planted 125 trees during its “quasquicentennial” (from September 2013 to March 2014). The trees range in over 100 species that are mapped out in a GPS-guided tour; from Overcup and Regal Prince Oaks, to Autumn Brilliance Serviceberry and Yoshino Cherry, the trees’ sizes and species names are breathtaking. Most mid-sized private universities have beautiful and scenic campuses like Elon University, so what makes this institution unique? Their commitment to the oak tree is not just a symbol that sounds good on tours and entices new students, but it is a valuable mascot for the university and its core values. Since the early ’90s, each Elon graduate has received an oak sapling on their graduation day, to welcome them to the community of Elon alumni. What started as a gift from the 1991 graduation speaker (an Elon alum who had a career in the timber business) became a permanent tradition at Elon Commencement; starting at the beginning of his time in office, the current Elon president gives each student an acorn at New Student Convocation to symbolize the beginning of their college careers. The table of oak saplings for Elon’s graduates to plant in their post-grad life. 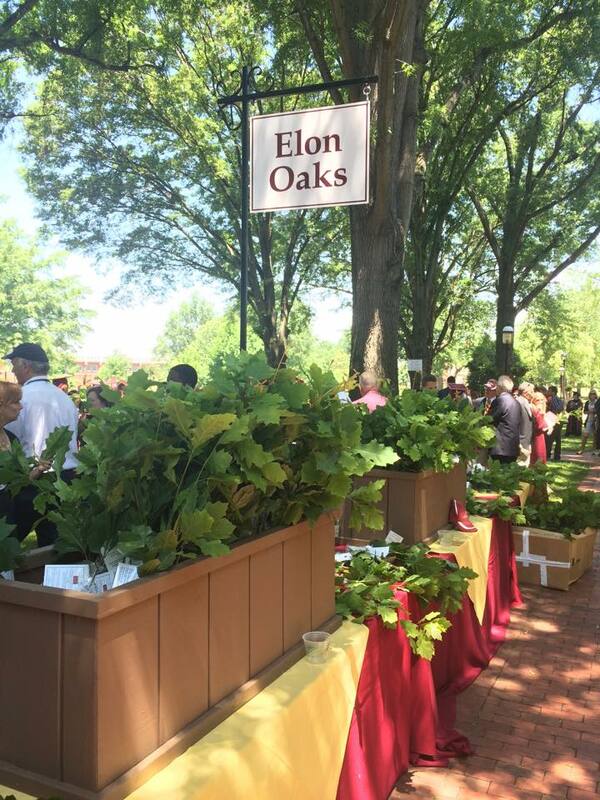 Of the about 1,200 students who graduated from Elon college last weekend, all of them went home with oak saplings. Viewed as a right of passage for completing their undergraduate journey, the oak sapling is not just a tangible souvenir to complement one’s diploma, but it is a graduate’s first chance to make their mark on the world. Each of the oak saplings will rapidly grow into mighty oak trees, and when they do, they will help benefit whatever environment surrounds them. According to the Arbor Day Foundation, one large tree can provide a day’s supply of oxygen for up to four people. Over one whole year, a mature tree can absorb more than 48 pounds of carbon dioxide from the atmosphere and release oxygen in exchange. Not only can trees help undo the damage humans have done with carbon emissions in our atmosphere, but they also help save energy and reduce crime. According to the Department of Energy, carefully positioned trees can reduce a household’s energy consumption by up to 30%; the placement of three trees can save a family $100 to $250 a year in energy costs. Lastly, the U.S. Forest Service found that trees also reduce crime. In Baltimore, for example, a 10% increase in tree canopy resulted in a 12% decrease in crime. Thus, planting trees has environmental, fiscal, and social benefits. It’s inspiring and exemplary of Elon University to not only give their graduates the gift of higher education, but also the oak sapling. Just as a student’s lessons at Elon will develop into a life-long career and vocation, the small oak sapling they receive at their commencement will grow into a tree that can better our earth’s environment and so much more. Hopefully all of Elon’s recent graduates will plant their oak trees, and that the 1,200 new oaks each year are just one small example we can follow to make a greater difference.